This image was created in a botanical garden in Miami, Florida. 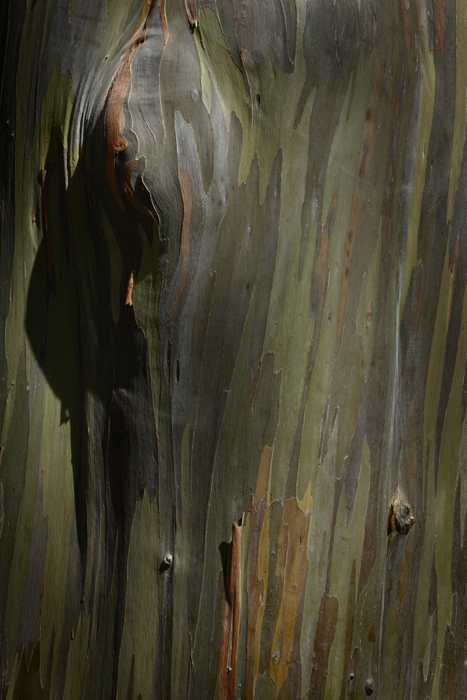 I have seen many Eucalyptus trees. Most have bark colored in some combination of dun, soft orange, and blue. This one stopped me in my tracks. Never had I seen such colorful strips of bark. They reminded me of the complementary hues in a color wheel, with green and magenta as opposites. Normally I don’t photograph in the middle of the day. Light is generally flat. But due to the size of the knurl on the side of the tree, the unmitigated sun cast a hard shadow reminiscent of George Hurrell’s Hollywood portrait lighting. I enjoyed that, and the way that raking overhead light accentuated curvilinear ripples in the trunk.